For decades rock hounds from all over the world visited the McKinney Mines to collect many different types of rocks and minerals. However, for the last 30+ years the dumps have been closed to collecting. 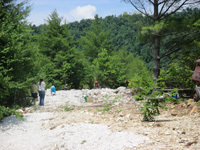 Recently, the dumps have been cleared and turned over, and rock hounds are invited to collect on these dumps. Unlike other area “mines” the dumps are authentic and we do not add ANYTHING to them. Whatever you find is truly native to these mines. The McKinney Mines have produced over 100 different rocks, minerals, and gems. Gems are scarce but many rare minerals can be found. You will find nice Mica specimens as well as Smoky Quartz, Feldspar, and Garnets. Aquamarine & Green and Yellow Beryl have been found along with many rare and unusual rocks & minerals, including Columbite, Samarskite, Torbernite, Uranophane, Hyalite Opal, Malachite, Tourmaline, Thulite, Amazonite, Pyrite and Dendrites. What you find may or may not have great value, but you’ll make memories that you’ll treasure forever. This is the real deal! Digging on the dumps is hard, dirty work, and most people would be happier going through a gem bucket at our flume. The fee to collect on the dumps is $20 for adults and $10 for children 12 and under. 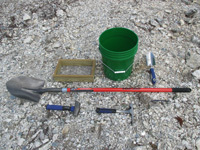 Bring your own tools, or rent a set from Emerald Village for $25 per day ($100 deposit, $75 refunded on return). Only hand tools are allowed and you can keep anything you find. A small creek is nearby for washing your finds. All persons entering the dumps must pay a fee and sign a waiver of liability form. No reservation is necessary and you can get a digging permit any time Emerald Village is open.